His Building Blocks: Our continuous quest for more "natural" living. Our continuous quest for more "natural" living. Those of you who regularly read this blog probably know that I now cook almost all of our family's meals from scratch. We are trying to avoid consuming packaged food products that have ingredients we would never keep in our pantry. If you are also looking to make smarter choices in regards to the consumption of processed food, to start, look for "foods with ingredients we know, recognize, can situate in some part of the plant or animal kingdom, and can pronounce" writes David Katz, M.D., director of the Yale Prevention Research Center. For example, if you are reading the ingredient label for Reese's Puffs cereal, you will see some of the following ingredients: Whole grain corn, sugar, Reese's Peanut Butter (peanuts, sugar, monoglycerides, peanut oil, salt, molasses, corn starch), dextrose, corn meal, corn starch, corn syrup, rice bran and/or canola oil, salt, Hershey's cocoa, tricalcium phosphate, red 40, yellows 5 & 6, blue 1 and other color added, trisodium phosphate, artificial flavor, TBHQ and BHT added to preserve freshness. There are items in that list that you would NEVER keep in your pantry. In fact, there are some known carcinogens in that list. So why in the world would we want those ingredients in our bodies, or in the bodies of our children? We started asking these questions and educating ourselves with regard to the food we consume. Now that we have done so, we cannot go back to eating the way we once did. Once the blinders are off, you can no longer comfortably consume carcinogens. So naturally, we began looking at other products to which our bodies are exposed: laundry detergent, deodorant, lotions, soaps, facial cleansers, toothpaste. Our skin is the largest organ of our body. So, if I am so concerned with what ingredients are entering my body via the food I consume, why shouldn't I also be concerned about what carcinogens to which I am exposing my skin (and the skin of my family members). Therefore, our expedition this year continues to remove many of the other ways we are exposed to these carcinogens. We have begun by purchasing more natural substitutes to our previous toothpastes, cleansers, deodorants, lotions, etc. We will likely eventually make our own. We are starting with making our own laundry detergent. Why not? It is considerably cheaper, better for the clothes and for our bodies. And, it takes very little time. What's not to love? Here is how we made our first batch. First, go to your local grocery store and purchase some Borax, Arm and Hammer Super Washing Soda (both in the laundry detergent aisle), and a bar of unscented natural soap (I found a Dr. Bronner's bar in the "natural and organic" section of our grocery story, HEB, but you could also use an unscented, natural Ivory soap. Dr. Bronner's soaps are great because they are fair trade, made with exceptional ingredients like vegetable castille soap and pure organic essential oils. I chose lemon, which smells amazing!) Also, stop by the bakery and ask for one of their 5 gallon buckets. They throw them away every day (they once contained icing). Oh, and by the way, they happened to have the ingredients of the icing printed on the bucket and after reading that we will never be consuming that again! Yuck! 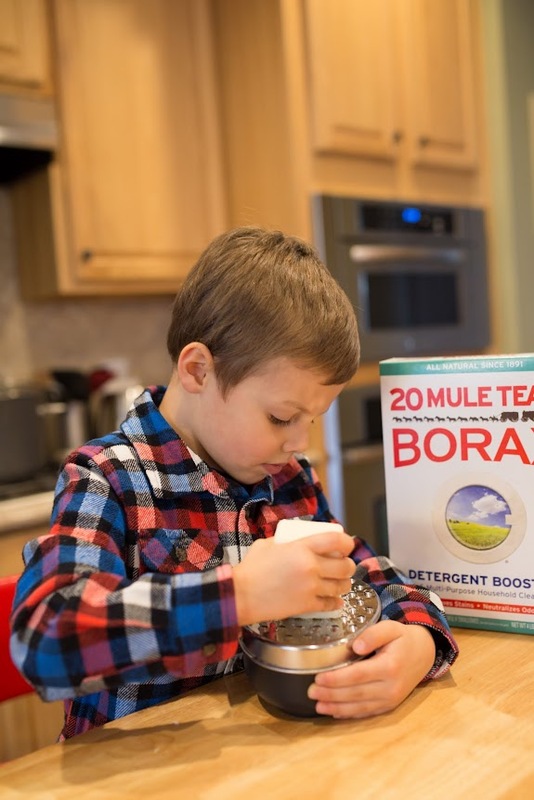 (Side note: The name, Borax, sort of sounds very "chemically" doesn't it? But actually, it is a natural mineral made of sodium, boron, oxygen and water. It is in most of the "natural" soaps out there, but of course the "natural" detergent is much less expensive for you to make yourself. 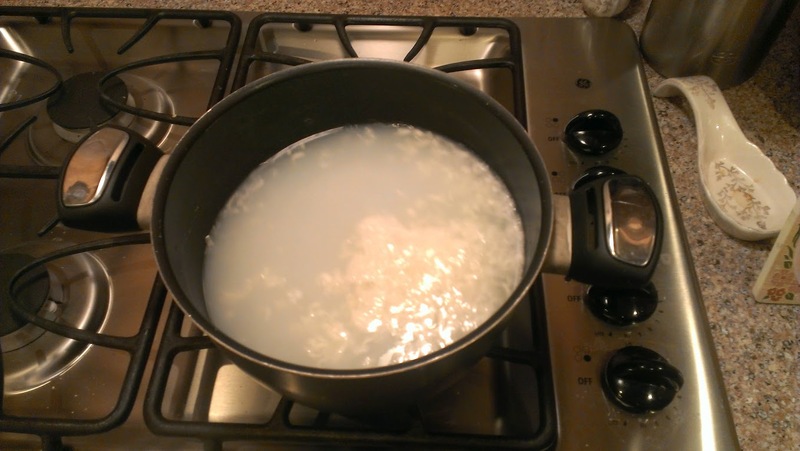 And here is how you make some natural liquid laundry detergent. 1. Grate the bar of soap, either by using a cheese grater or a food processor. 2. Next, put the soap into a pot with two quarts of water and slowly heat it up, stirring continuously, until the soap is completely dissolved. It dissolves rather quickly over low heat. 3. Put 4.5 gallons of really hot tap water into the 5 gallon bucket. 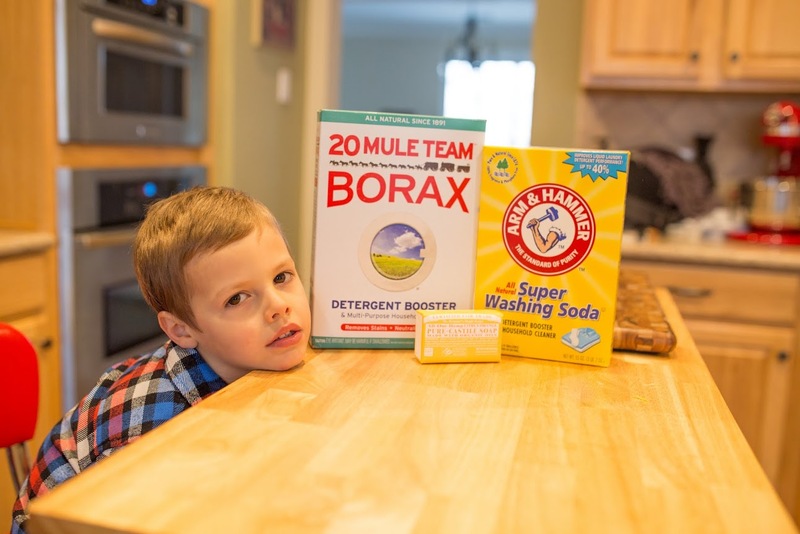 Add a cup of borax and a cup of the arm and hammer washing soda and stir until it is completely dissolved. 4. Pour the dissolved soap mixture from your pot and into the 5 gallon bucket. Stir well. 5. Cover the bucket and leave it overnight. The bucket that we got for free from the grocery store bakery is actually very nice. It even came with a lid with a rubber seal! 6. Shake or stir until smooth and pour into gallon jugs or other containers. We actually just used up our previous store-bought detergent. So, we plan on filling that container up and leaving the rest in the bucket until we run out of detergent in that container. 7. Use 1/2 cup to 1 cup per load, depending on how heavily soiled your laundry is.